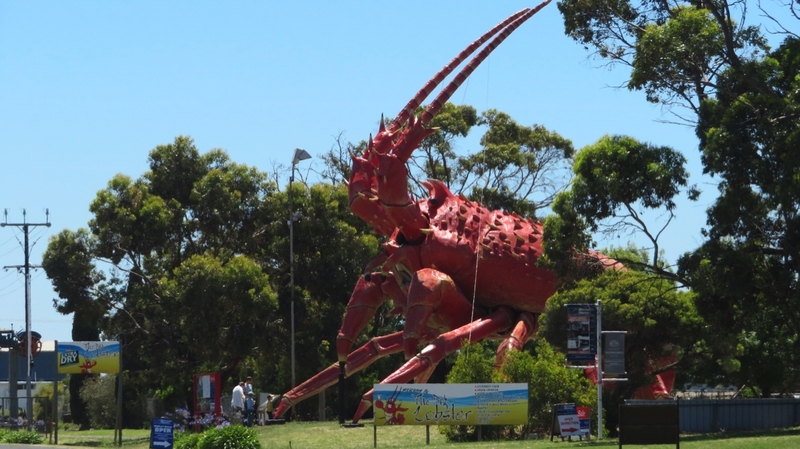 The next 6 days (until we reach Balnarring) are what Steve refers to as ‘transfers’. That is, we’re not being travellers taking our time to see and enjoy where we are, we are just driving – big difference. However we’ve still chosen a scenic route which I’m sure we’ll enjoy. Saturday morning as we headed south the wheat stubble and brown fields gave way to grape vines as we entered the Clare valley. We stopped for an enjoyable afternoon tea with Bob and Cathy’s daughter Hannah, Raine and baby Dean. Then through the Barossa to stop the night at the tiny town of Palmer, where we camped beside the cricket oval. We even got to enjoy the last session with prime seats! Palmer won. The oval is virtually in the middle of a well-established olive grove – interesting! We dined at the pub where the meals have been highly recommended, both ordering the pork belly and not being disappointed. The publican last night recommended a scenic drive that would eventually get us back onto our track. 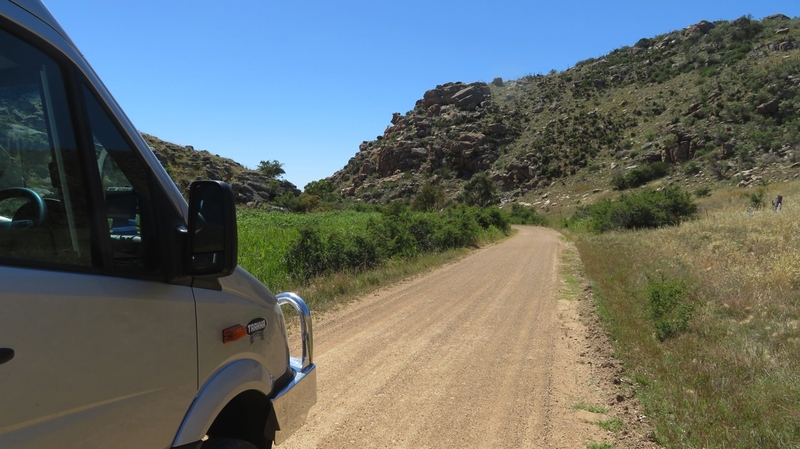 It took us along an unsealed road through grazing land along a valley and through a gap in the granite hills. Unsurprisingly it was called Gap Road. We came out near Mannum where our publican had recommended we see the waterfall. The Gap on Gap Rd outside Palmer. Pretty drive. 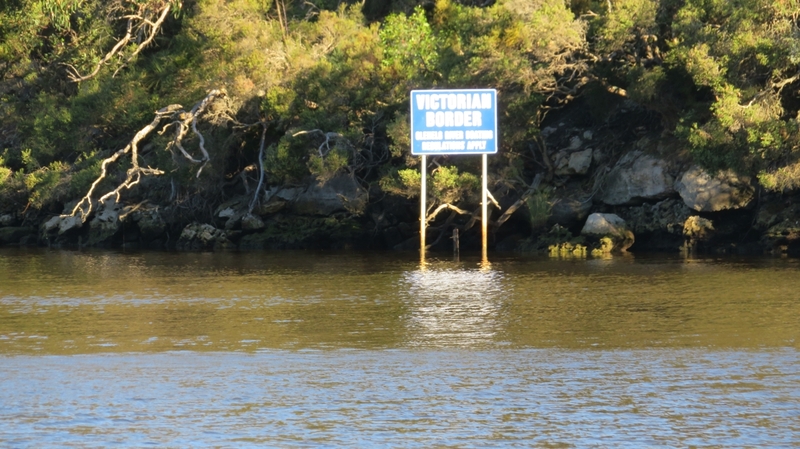 From here we followed the highway to Murray Bridge and crossed the Murray on the first bridge ever built across this mighty river. It was good to be back to the Murray again after following it closer to its source for a few weeks back in March this year. Even more exciting was driving along the shore of Lake Alexandrina and Lake Albert which is where the Murray finally reached the sea. Tonight we’re camped at Kingston SE in the RV park right on the shore ($10) – brilliant location, if maybe a little windy. Monday morning we went for a walk along the river to the mouth and back through a park where the locals have put in some sundials of different types – doesn’t sound great, but it was very good. Then to the cafe where we had coffee, bought lots of gifts for Christmas and downloaded some podcasts using their wifi. Excellent cafe. Good experience at Kingston SE – well done! Onwards to Robe for brunch, parked overlooking a small marina, before moving on to the Lighthouse Lookout. 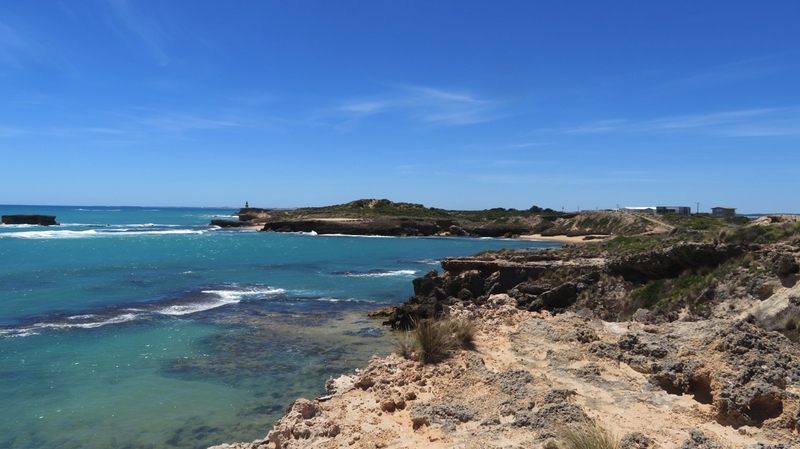 Perfect day weather-wise and magnificent views of the shore, coastline and ocean. At Mt Gambier we had another break. The Information Centre has a museum which is excellent – note to self- allow at least an hour, or more, to view this next time. 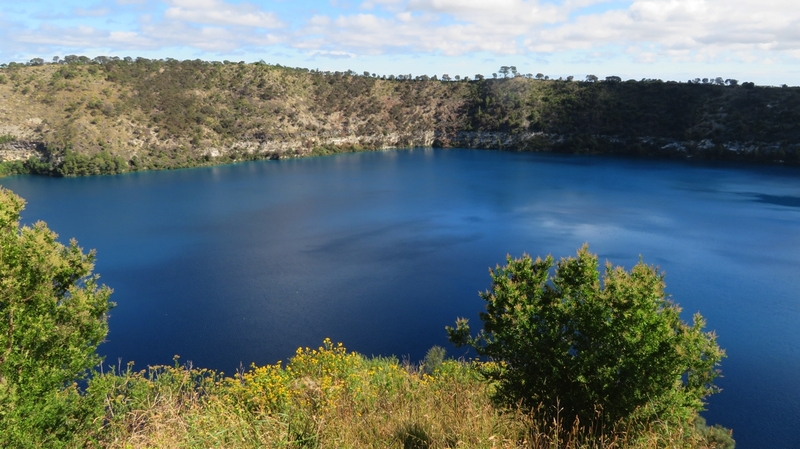 We emptied our water tanks of the last of the metallic-tasting Norseman water and refilled with the amazing water from the Blue Lake which provides Mt Gambier with its water supply. This 72m deep lake is the crater of a volcano, the very clear water in it filtering through limestone rock to fill it. There is a sudden change in water colour from grey through winter to vivid blue, the change occurring over a few days at the end of November. This dramatic colour change occurs as the sun is higher in the sky, the pure waters refracting more blue in the colour spectrum and the cleansing of the water as tiny calcite crystals reacting to the warmer water fall to the bottom, taking organic material with them. 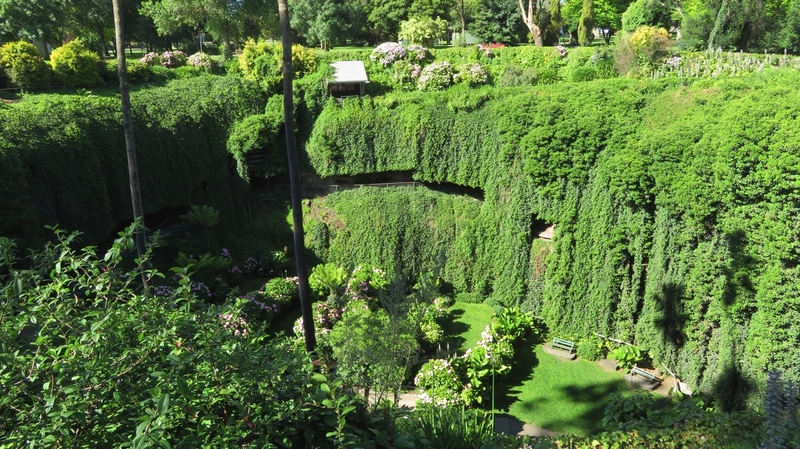 From here we drove around to the Umpherston Sinkhole which has been made into a cool, relaxing garden. Thousands of years ago the underlying limestone cave collapsed creating this deep, steep-sided sinkhole. James Umpherston owned the grazing property which contained it. In 1884 he decided to make it into a garden for the locals to enjoy. Umpherston Sinkhole. An incredible sight. 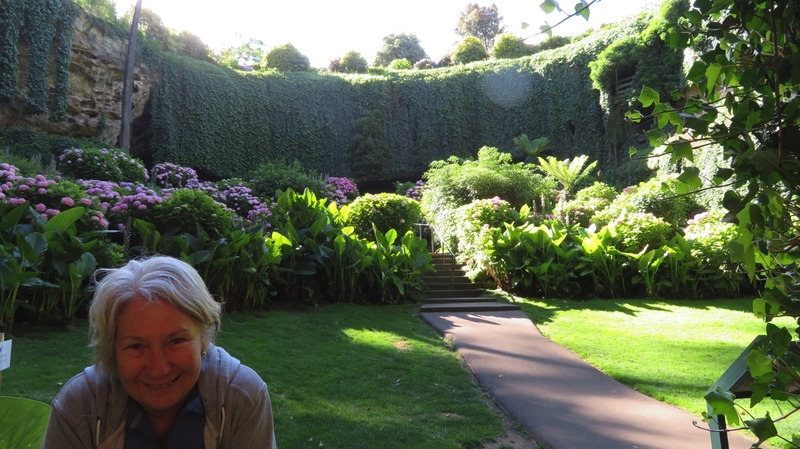 It’s had a mixed history since then but today a ramp and stairs take you down into the sinkhole where the grassed, terraced base is planted with hydrangeas and tree ferns, the steep sides dripping with ivy. Under a cliff overhang are picnic tables and a BBQ. This evening’s destination is free camp at Dry Creek which is on the Glenelg River, on the SA/Vic border. This unlikely camping spot is really just a parking area for fishers launching their boats at the boat ramp here. A tree-lined dirt road in off the main road ends in a turning circle and camping is wherever you can find a level enough spot. Built out off the shore and over the water are half a dozen shacks. It’s a lovely spot and we sat on the jetty enjoying our sundowners and chatting to the fishers launching their boats. A quiet night. Not quite in Victoria yet.